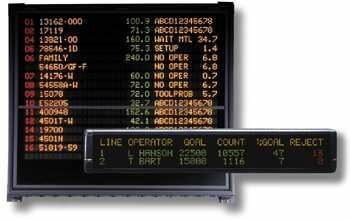 The EE group provides the best in electronic displays and signs. Keyed individually or as a group they notify and alert patrons and personnel to changing circumstances in your facility. 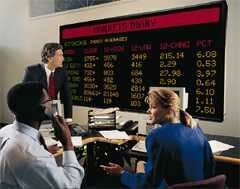 The work via your LAN, by wire or by coded radio signal. 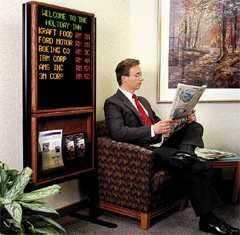 Bright and easy to read, these displays stop the noise pollution of overhead paging systems. They don't add to the confusion when an important alert is broadcast, they are silent and fast. Order yours today and improve the communications in YOUR facility immediately. AlphaNET messaging software enhances every aspect of electronic messaging–from sending and creating, to the editing of text, animations and graphics. AlphaNET software brings together all the essential tools for realizing the full potential of Alpha® displays, with unique features that include: high-level capabilities for group messaging (via serial, modem, wireless or LAN network), an animation library and support for .GIF and .BMP files, calendar/date message scheduling, Jasc® Paint Shop Pro, Animation Shop Pro (PSP), Site Manager, and Message Emulator, all within a useful and intuitive interface. Create multiple messages to communicate special events, incentives, news, and congratulations that contain text with logos, graphics and animations. For added versatility and message enhancement, included is a unique counter feature to display the minutes, hours or days to an event or occasion.